One of my customers dropped in yesterday to brighten up my first Sunday working in a while. It's the season to be OPEN all days from Nov 27th to Dec 24th... long haul but it's our shop's way of providing all opportunity for our customers to shop during a busy time. The topic of skirts came up. 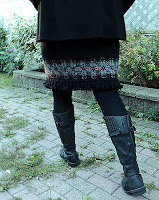 My friend V loves skirts over leggings, very practical I say since our winter winds can be very harsh. She is currently working on one called Tartan Love. This sweet little plaid number could easily fit over leggings and what a dynamite fashion accessory. So, check them out on ravelry - have some fun with style and colours... Thanks V for the great idea!! Grey Heron News November 2015 We have expanded our holiday shopping hours for your convenience. Looking for your next project? Come in and let us help you….